Hey friends! I hope you had a lovely weekend, and a great Valentine’s Day to boot! We made more progress in our master bathroom over the past few weeks, and I am so excited to share with you today! We finally have finished painting and tiling in our shower stall area. And might I just add before we get started that this isn’t the best spot to photograph. I did the best I could. This drywall was pretty damaged for about a foot or so above the builder grade shower stall. It was cracked and peeling. Our solution was to install subway tiles around the top of the shower stall, so that it would be waterproof. This was also the last part of the bathroom that was still not painted, so after the tiles were installed, we finished painting as well. We are getting so close to calling this bathroom finished, and I can’t wait! Let me tell you about this shower stall. It is the bane of my existence. When we bought this house, I did not realize how small this shower was. Yes, I did open it and look inside when we were house hunting. I only saw that there was a separate shower and bathtub, and those were both must haves, so when I saw this house had both, I checked it off my list and didn’t think much about it. Until we moved in and I had to take my first shower in here. I kid you not when I say that I couldn’t figure out how to accomplish all that I needed to accomplish during my shower! How to wash my hair and my body, and shave my legs without water continuing to pour down upon me. There was nowhere to move to that water wasn’t hitting me. I was so frustrated! I would have to turn the shower head away and point it towards the back wall. so at least I came up with a solution. We briefly considered ripping this out and enlarging the shower and having a glass wall between the shower and the bathtub. You can see that the shower is inset back into this nook, and we thought we might use some of that space to enlarge it. Until we realized how expensive it would be. So we nixed the idea because it was out of our budget. We decided we were going to have to work with what we had and just improve it as much as possible without major construction. Here are a couple of pictures of what was happening right above the shower stall. We did change out the shower head about a year ago, before the paint started peeling and chipping. See the lever sticking out of the shower head on the right? It adjusts to different settings, and we can even turn it off, so it makes it easier to get away from the stream of water to wash hair and shave when needed. This is a shot, from taking a picture into the mirror, of the shower stall before subway tile and paint. You can see that it was a cucumber green color, which used to be the color of the entire bathroom. This was the last part to be painted, because of the water damage. And here is a similar shot into the mirror after the tile work and painting were complete. This is a picture of where we started with this shower stall. Before paint, before tile, before the new shower head. this was taken right after we moved in, and the decor was brought straight from our old house. This glass shower door is also not my favorite. I just think it is ugly. But I don’t want to remove it because the shower stall is so small that I fear a shower curtain will be blowing in on our legs and making me crazy. So I choose to cover it up with a shower curtain so that you can’t see it. This was my very first experience installing ceramic tile. I think I did a fairly good job, but it is definitely not perfect, and I definitely don’t feel experienced enough to write you a tutorial for it. I bought all of my supplies at Home Depot. They are small mini tiles, and they are mounted on mesh, so they come in sheets. I thought this looked like something I could work with, because they are already all spaced out and it would require minimal cutting, I thought. You can find the exact tiles I used here. I purchased a manual tile cutter that you can find here. I chose to install the tile using something called SimpleMat. This requires no mortar, and there is no mess, and no waiting between setting and grouting. Which means you can complete your project in a day. It took me about 1/2 of a day to complete this project. The grout I used Fusion Pro Simple Componenet Grout in the color Delorean Gray. This was something I received in my goodie bag when I attend the Haven Blog Conference last summer, and it just so happened to work with the Simple mat and be a good color to use in this bathroom. I think I did a pretty good job, but the corners are not perfect. I do think I learned from this experience now that it is finished though, and I can do better on the corners next time. that is why I started in the shower stall. I plan on tiling above our bathtub and on the backsplash over the sink as well. So this was the least visible place. Hopefully I will do better on the other spaces. Before I started installing the tile, I scraped all of the loos paint off with a scraper, and then I sanded it down a bit. I noticed during this process that it had been repaired before, so this definitely was not the first time this had happened in this shower. I knew then that I was on the right track with choosing to cover it with tile. After I had scraped it, I did use some spackle to smooth everything out and make it as level as possible. In case you missed it, we had a new light installed over our bathtub a couple of months ago, and we love it. You can read all about it here. You can also read all about the new paint color and the new shelving in the master bathroom by clicking here. this little nook where our bathtub is is quite possibly my favorite spot in the house. I love a good soak in the bathtub! I love my white ruffled shower curtain. I found it a couple of years ago at HomeGoods. Because this shower stall is so narrow, it is difficult to find a shower curtain rod for this space. The one I have here is the best I could do. When we installed out new shower head, we were no longer able to hang our shower caddy over the shower head because of it’s size. so we now hang it on the cold water faucet. I actually like it there better. Reason being because when I have the shower curtain closed, which is how I leave it when not in use, you can’t see the shower caddy. So it is totally hidden by the shower curtain, and it just makes for a cleaner, less cluttered look. And we have to have this shower caddy because there is nowhere else to put things in this tiny space. You can see here where the shower head pipe comes out of the wall that I had to make a couple of more complicated cuts with the tiles. Since my manual tile cutter only does straight lines, I had to make a couple of cuts. I didn’t leave any space between them, so you really can barely notice them. And the ring at the top of the shower head that goes against the wall was gross and rusted in spots, so I cleaned it up and spray painted it with some mirrored spray paint I had on hand. It looks so much cleaner now! You also get a look at my corner work in these next two pictures. After this experience, I really think I can do a much better job on the bathtub area. Fingers Crossed! All in all, this space is such a huge improvement. I really feel I have made the most of a bad situation. The cucumber green is gone, and the wall is now protected from the constant stream of water. I actually don’t hate taking a shower in here quite as much now as I used to. But I have learned one lesson from this experience. 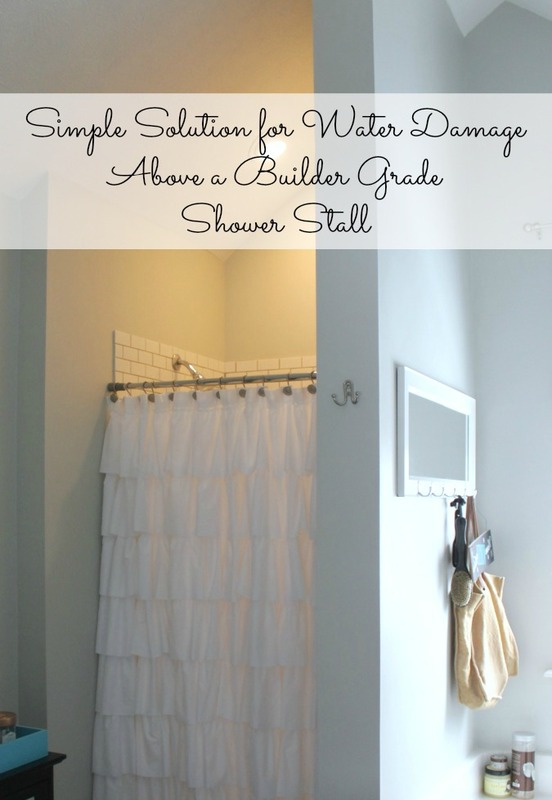 To step inside the shower stall next time we go house hunting! Here is a shot of the bathroom before we painted the shower nook. And here it is now, finished. I am so happy to have this space done! I had put it off for way too long! The ceiling is just so high and it is such a tight space, I was dreading it. I have to admit, I had a hard time getting it perfect up around the ceiling because of the slope of the ceiling. I am not thinking about having the ceiling in here professionally painted. It is really difficult to cut out on tall sloped ceilings. If you are noticing my toilet paper holder, it is a thrifted makeover, and you can read more about it here. This is the view I have into my bathroom while lying in bed in the mornings. I am starting to like what I see now! I love the heart on the wall that was a Hobby Lobby find. And that black cabinet will be receiving a paint job at some point. It doesn’t fit in in this space, but I need it for storage and it fits perfectly here. So I think I am going to paint it with white chalk paint, and give it a distressed look. What do you think? I made over the sink and vanity cabinet last year, and you can read about that here. Thank you so much for stopping by today, it is always nice to have you here in my neck of the woods! Just a few projects left in this room and it will be complete. I am dying to know what you think of my solution here to the water damaged drywall. Feel free to leave me a comment! I love comments and read and respond to every one! 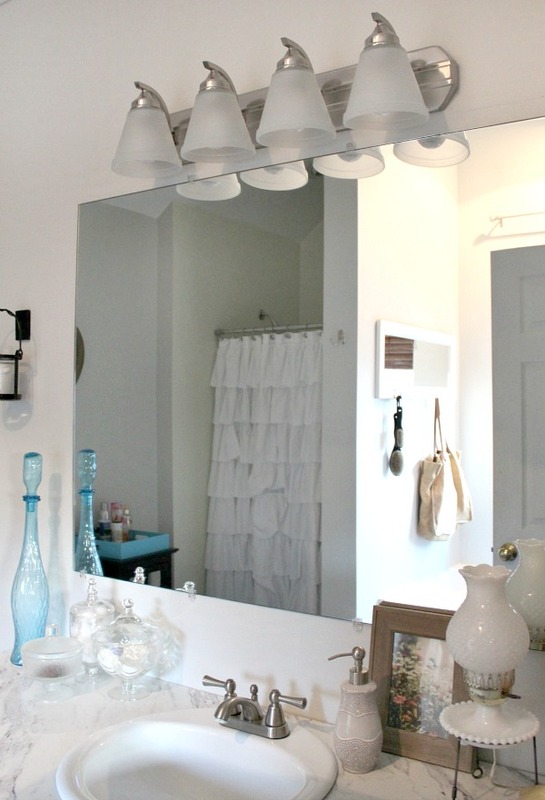 After this room is finished, I have another bathroom makeover on the horizon. I can’t wait to show you what I have in store in that one! I hope you have a blessed week this week! Come again soon, OK? Love the stylish decor and it is such a modern design. We actually need to redesign our shower fixtures. I can’t wait to see all of your bathroom selections come together!